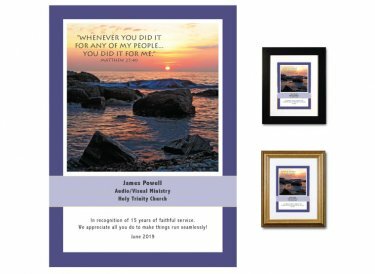 Lovely service appreciation plaque featuring an Atlantic Ocean sunrise is paired with this excerpt from Matthew's Gospel: "Whenever you did it for any of my people...you did it for me." You'll personalize it with the recipient's name, job title, and the name of your church or organization. Ample space is available for you to add your own special sentiment.